This is a reoccurring problem of Netrunner players: they stick to their known jargon. I’ve seen (and done it myself) with all sorts of games! “I’ll install this trait card” in EVOLUTION! A game that’s thematically so far removed from Netrunner that it doesn’t even make sense. 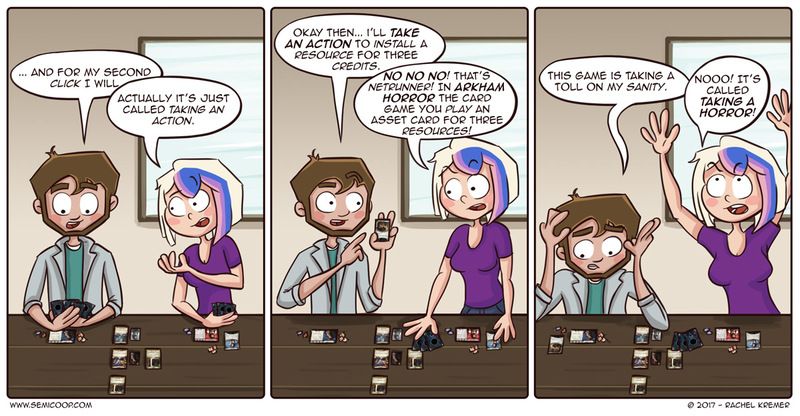 😉 But with Arkham Horror the Card Game it gets more confusing due to the overlap in certain mechanics and keywords and they both are games by Fantasy Flight Games. So it’s been a while since we’ve finished the core set of Arkham Horror the Card Game and we loved it. 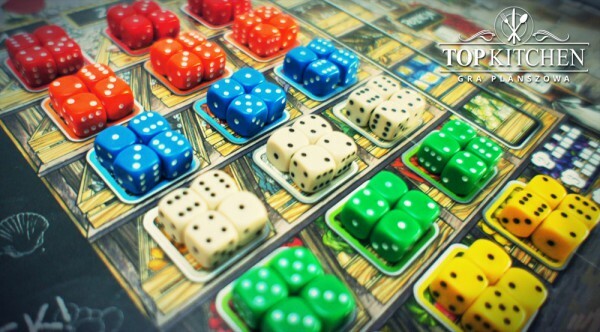 We’re still so happy that we got this game from our BGG Secret Santa! During the entire game we had no idea whether we were winning… or just losing badly. It feels more like a story your characters have to endure and they will have to endure A LOT. Roland Banks, my poor fellow, went insane in the end by having to endure a little more than he could handle. To linger a little longer in the truly mad but wonderful world of Lovecraft, we started playing Mythos Tales… and we’re hooked! We are big fans of Sherlock Holmes Consulting Detective, so when we heard that there was similar game in the Arkham setting: TAKE OUR MONEY! We’ve finished and beaten the first two mysteries and we’re very eager to continue. We’ve already filled 20% of our designated notebook and are writing down all kinds of things we think might be important for an overarching plot. The fact that you can get access to additional information when you’ve visited certain locations makes it very exciting. And you might have to think twice before going to a location with a possible monster -at night-. All the sudden these things matter and it gives the Consulting Detective experience that we love another fantastical layer. What was the first game you’ve played in 2017? I enjoy playing Hero Realms a great deal. The reason you haven’t found any opinions on the campaign deck, though, is that it isn’t due out now til March or April. Basically, they doubled the number of cards, so it’s still in development. Montgomery is correct, the Boss and Campaign decks aren’t out yet. Those are definitely what I’m most excited about though. The Core game itself is just Star Realms with a fantasy theme and asymmetrical starting decks if you get the Character packs (which I think are necessary if you want to play the Campaign stuff later). The balance is good and the card quality is better than Star Realms, so I don’t think I’ll be sleeving them. The art is on par with Epic. I managed to get it for a few dollars cheaper by buying it at a convention, and I’m quite happy with it, and really can’t wait for the co-op stuff. Thanks for the info, keep us posted! Star Wars Imperial Assault, followed by Robinson Crusoe. If you haven’t tried Robinson Crusoe, I seriously recommend it to you guys. As for Imperial Assault, nothing to say, you already play it. there is a mini-expansion that can make anny senario a bit easyer, also did you guys break they spyglass promo? The best way to make it a tad simpler is to add the Dog and/or Friday. 2 Player game, go with both of them instead of just Friday and 3 player game go with Friday instead of dog. We’ve been beating the game on an acceptable rate like this. No need to go with extra items. mechs VS minions and ghost storys where the new games for me. I think Clank! was out first one this year. I hope it’s not an indication of how things are going to go as we were both devoured by the dragon! I’ve played through the Night of the Zealot a couple times and I’ve yet to drive an investigator insane — and that poor Beat Cop keeps rejoining the team despite how many times we send him to his “death”. Considering renaming him “Beat Up Cop”. We too have let the Netrunner jargon spill over to Arkham — just yesterday we repeatedly “clicked for credit”, though oddly each refresh we “gain a resource”. But Arkham is gaining its own slang: at our tables we ask if Daisy can “book me” (use her Old Book of Lore) when we need to find a particular card. It’s a silly, happy penguins-racing-through-the-halls dexterity game. There are actually a number of boxes within the main box and they have little doorways on certain sides. The doorways line up and all these boxes actually assemble into the playing area where the penguins slide. One player each turn is the hall monitor and tries to “catch” (by sliding their penguin into) the other penguins. Meanwhile, the other penguins are try to race through the doorways. The penguin pieces have a round weighted bottom that can be slid in fun ways … you can even flick its little head to make it do a little flip-jump over a wall! A great way to get the jump on somebody as the hall monitor. Definitely a fun, lighthearted way to start the year! Should we start playing Arkham Android: The Netrunner Horror Card Game? … actually, that might be interesting. Anyways, the first game I played this year was Aeon’s End. And it’s an amazing co-op deckbuilder with some interesting twists on the mechanics. I’m really sorry I didn’t back that one. Have you seen Terminal Directive, the Netrunner campaign expansion? I ‘m kinda hoping it will be like that. Haha, you’re right – thanks for pointing that out. Press ‘shift + F5’ to take away the annoyance! My first game was Sid Meier’s Civilization (tho FFG game), because we were in the middle of a game when we realized it’s five minutes before midnight. And yeah, why are they holding Encounter Cards in their hands? I can imagine with a game that takes that long to play, the clock strikes midnight before you know it.